Avengers, assemble! Or disperse, depending on how you look at the latest Earth-shattering occurrence in the MCU fandom. Almost five minutes of footage from the upcoming movie has leaked online! And it has an explosive revelation—from Fat Thor to Professor Hulk. We’re sure the leak will do nothing to the predicted massive opening of Avengers: Endgame on April 26. Nonetheless, if you’re one of those fleeing the Internet to get away from spoilers, tread lightly. This post contains SPOILERS from Avengers: Endgame. 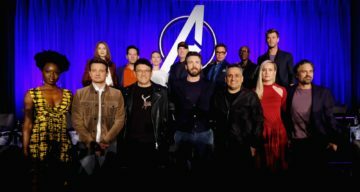 Ten days before Avengers: Endgame hit theaters worldwide, a five-minute montage of clips from the movie made it online. The revelations are beyond what any fan theory could imagine. According to many Reddit users, here’s what to look forward to in the upcoming movie. Bruce Banner/Hulk’s new intellectual look from Endgame has been driving us crazy since the image surfaced on the Internet weeks ago. You know, the one where Hulk, all big and green, is sporting a pair of glasses and shirt that we’re more used to seeing Banner wear. After refusing to appear in Infinity War, we’re finally getting a lot more of Hulk. And with a whole new avatar no less. You might recall the news that a scene from Thor: Ragnarok featuring a fat Thor and goth Loki was deleted from the final cut of the movie. If you were disappointed that the scene was deleted, fret no further. Endgame has a lot more of fat Thor. Thor’s also got his long, golden mane back (though not as shampoo commercial-worthy as we remember) with a much thicker beard. Now, it’s unclear whether this is a time travel or that Professor Hulk and Rocket the Raccoon are looking for Thor. Since Thanos went snapping his fingers all willy nilly, it’s suspected a significant amount of time has passed during which Thor got a little chubby. He’s shacking up with Miek and Korg now, and is drunk out of his senses. But he still remembers his old friends if his enthusiasm at seeing Hulk and Rocket is anything to go by. The Avengers are clearly working on something big, whether it’s for time travel, to defeat Thanos, or something else can’t be said. Either way, some of the greatest minds in the universe (the ones that survived the snap) are working on it. Insert some Tony Stark humor in here where he calls Rocket “Ratchet.” But the badass raccoon doesn’t appreciate it, immediately quipping, “You’re only a genius on Earth.” Burn! Also, fat Thor in sunglasses is here. A blink-and-you-miss-it scene shows Nebula and Professor Hulk working something on Ant-Man’s suit. Tying in with all the trailers and previews of the movie, we see the surviving Avengers in their silver and crimson suits heading determinedly somewhere. Captain America, Professor Hulk (we can’t emphasize how much Professor Hulk we’re getting), Stark, and Ant-Man are back on the New York battleground from the first Avengers movie. The OG team is dealing with the Chitauri, while the team from the future are trying to keep a low profile. The odds of the time-traveling team running into their past selves in the Battle of New York were too great to ignore. Unexpectedly, Captain America runs into himself and ends up fighting. This might be how the Captain gets his shield back, sans Blank Panther scratches. Another theory that seems to be coming true is Stark creating his own version of the Infinity Gauntlet. Powered by the Infinity Stones they retrieve while traveling in the past, the Stark Gauntlet looks a lot like a part of Iron Man’s armor. The run-up to crowning Hulk as the strongest Avenger in over 20 movies was for this moment. Hulk is chosen to wear the Stark Gauntlet with all the Infinity Stones. However, the power is seemingly too much for him. Rocket is hiding behind Thor while Hawkeye is behind Iron Man as they watch the gauntlet overwhelm Hulk. Thor calls for Hulk to take off the gauntlet, but Steve insists they wait and watch. Thor and Stormbreaker are face-to-face with Thanos again. (We’d like to see how they lured the Mad Titan out of his farm for this.) The rest of the surviving heroes, including Iron Man, fight Thanos, too. It appears the Avengers retrieved more than just half the Infinity Stones, because Mjolnir is back, too. And it has a new “worthy one”! Captain America is dual-armed with his old shield and Mjolnir, and proving quite the force against Thanos. It appears Mjolnir doesn’t miss Thor at all. The moment we’ve been waiting for! The surviving heroes succeed in reversing the snap to save their comrades. We hear Sam shout, “On your left!” (a callback to the scene from Winter Soldier) before the Captain sees a portal that T’Challa, Shuri, and Okoye step out of. Sam flies out right after and we know more of the Avengers follow. It’s time for the decisive battle with all the heroes, including the Guardians, Wasp, Spider-Man (*sniffs* We missed you, Peter! ), Valkyrie, and more of the universe’s alien forces face off against Thanos and the revived Black Order. #12 Peter Parker Is Back! The last time we saw Peter, he was reduced to ashes and we were reduced to tears. But he’s back and reunited with Stark. Mr. Stark is not afraid of his emotions now, as he hugs the kid. Carol Danvers is back as Captain Marvel, but what we didn’t see in the previous trailers is that she’s going to switch to a short, punk hairstyle more akin to the comic book character. As we expected Danvers to be the deciding factor in the battle against Thanos, she destroys the purple menace’s mothership. And she meets Peter Parker, who has the gauntlet, for the first time. It’s not clear if it’s Thanos’ Infinity Gauntlet or the Stark Gauntlet. But if Hulk is not strong enough to wield that power, we bet Captain Marvel is. The leaked footage certainly has some big moments, but there’s a lot more to anticipate in Avengers: Endgame when it hits theaters on April 26.